Since 1990, when Robert Jordan's The Wheel of Time® burst on the world with its first book, The Eye of the World, readers have been anticipating the final scenes of this extraordinary saga, which has sold over forty million copies in over thirty languages. 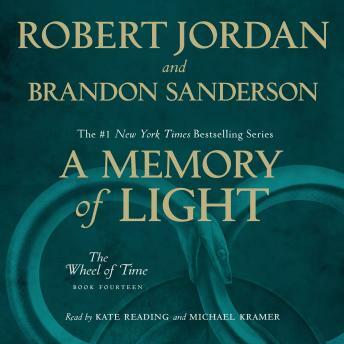 A Memory of Light is the fantastic conclusion to the internationally-bestselling epic fantasy juggernaut. Absolutely perfect ending to an excellent series. I could not stop listening! Incredible end to an epic series. Sanderson did an excellent job picking up where Robert Jordan left off. A Memory of Light is brings everything to a stunning conclusion that never drags despite its considerable length. It's been a great journey! I'm so happy I decided to undertake this amazingly epic series, but I'm sad I've made it to the end, Brandon Sanderson being one of my favorite authors has done a beautiful job finishing the series for Robert Jordan, "may the creator shelter him", after Robert Jordan's unexpected death. These two narrators are also my favorites. They do such a great job conveying the story. Thanks! The end of the series brings it all together and makes up for all the seemingly unending game of thrones boredom that dragged down the mid to latter books. Sanderson did an excellent job with the material. I love wheel of time. at times the series got a little slow but it never failed to pull me back in!!!!! This has been a great ending to a very excellent series. Really enjoyed it. Very well written. once again the narrators were excellent, they brought the characters to life. Made me feel like I was there. A fantastic ending to this amazing series. Read exceptionally by the narrators who really bring the characters to life. A wonderful read as expected. Sanderson and Jordan are always a pleasure. Sanderson seamlessly picked up where Jordan left off and I think Jordan would have loved what was done with his masterpiece. Reading and Kramer are like old friends now. Just plain loved it. Glad for the conclusion. It tired them all together in the end.